In what is deemed to be another mega deal of the year, Taiwanese electronic components contract manufacturer Foxconn is acquiring a 66% stake in Japan's Sharp Corp for US$3.5 billion, thus ending almost a month of haggling over the price after Sharp disclosed further liabilities. The purchase price is said to be nearly US$2 billion lower, after Sharp disclosed nearly US$3 billion in potential liabilities to occur in the future. For the 66% stake, Foxconn will pay 88 yen for each Sharp share, which also is a lucky number for the Chinese! Foxconn will also buy all the US$1.7 billion worth of preferred shares owned by Sharp's two main creditor banks, said a Reuters report. 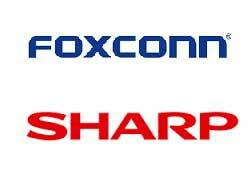 Foxconn also has the option of increasing its stake in Sharp next year. Foxconn, formally known as Hon Hai Precision Industry Co, will gain access to some of Sharp’s technology such as its advanced LCD screen technology that allows it to have a better pricing margin with its major client Apple, say news reports. US phone maker Apple uses Sharp’s LCD technology. According to research firm IHS, Sharp provides roughly 25% of the iPhone displays. With competitors like Samsung and LG Display breathing down with their OLED (organic light-emitting diode screens) which are thinner, lighter and more flexible than other displays, Apple needs to be in an advantaged situation for its next iPhone launch in 2018 and it is expected that Sharp will be able to provide this. The screen adds on to the cost of a smartphone, costing as much as US$54 each, according to IHS. The deal is also the largest acquisition by a foreign company in Japan's technology industry, thus ending the independence of 100-year old Sharp. But Sharp and other Japanese electronics firms like Sony have been struggling to stay afloat and compete with Asian rivals. Sharp started to decline decades back when it invested billions of yen to expand its LCD manufacturing facilities but was unable to keep up with the competition. Meanwhile, analysts say on top of Foxconn’s other problems such as China’s rising labour costs and a global slowdown in the smartphone market, it will be saddled with the problems of an ailing business that will take considerable money and effort to turn around. Plus, Apple has also been diversifying its supply chain, giving some production contracts to other assemblers and component makers.